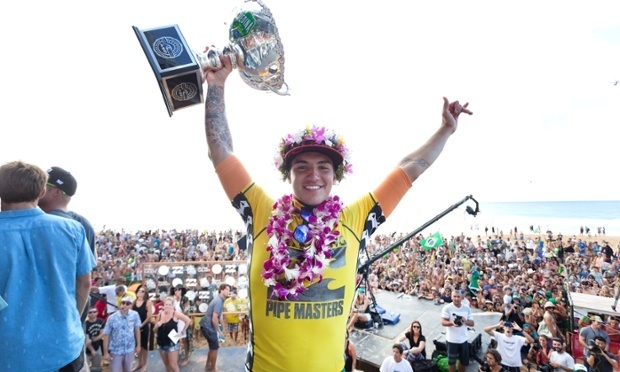 THE YOUNG BRAZILIAN GABRIEL MEDINA WINS 2014 ASP WORLD TOUR. BOSH! Gabriel Medina has won Brazil’s first world surfing title after rival Mick Fanning failed to make the Pipe Masters quarter finals in Hawaii. The 2014 World Championship Tour season came down to the final event, held at the famed Banzai Pipeline on Oahu’s North Shore.. Monday saw the start of the Billabong Pipe Masters. With Gabriel Medina, Mick Fanning and Kelly Slater all still in the running to be crowned 2014 ASP World Champion, but it was the young aerial specialist Medina who took the crown. Fanning’s hopes of snatching the title from the world ratings leader Medina came to a halt when he lost to Brazilian giant-killer Alejo Muniz in round five. Medina, 20, had already won through to the quarter finals and the large contingent of Brazilian fans erupted on the beach when Fanning failed to advance past round five.